Rated PG-13 for thematic content, language and drug material. “Sometimes things are better when they’re not perfect, you know?” Maisie Williams’ character wonders dreamily in the mawkish indie drama “The Book of Love.” If only that were true of the film itself. The feature debut of director and co-writer Bill Purple does not feature a single authentic moment. Imperfect would actually be a step up. Filled with contrivances, false emotions and even flimsier accents, it strains mightily to tug at our heartstrings while also enticing us with whimsy, and fails on both fronts. This is a movie that features not one but two Manic Pixie Dream Girls, albeit in different shades of glitter. Jessica Biel plays the first: a floppy hat-wearing, Jeep-driving, free spirit of an artist named Penny. Pregnant and playful in denim overalls, she’s the kind of person who throws out a pair of brown loafers belonging to her uptight architect husband, Henry (Jason Sudeikis), in favor of purple running shoes on the day he’s scheduled to give a potentially career-changing presentation. But she’s so adorably daffy, he doesn’t mind. “My pa used to say the most important thing to have on any journey was a compass. It tells ya where ya goin’ and where ya been,” the British “Game of Thrones” actress intones in an iffy accent. Also: “My pa used to say that most stories usually don’t start where they’re supposed to.” It’s like that. A lot. Both women will change Henry, for worse and eventually for better, over the course of the film. When Penny dies in a car crash early on, she understandably devastates him (although Sudeikis, a reliable comedian, struggles to convey the depth of his character’s loss as he stretches dramatically). But her last request of him on that fateful day was to try and help Millie, whom she’d smiled at through the kitchen window and formed a supposedly magical connection. So Henry reaches out to Millie, who’s initially suspicious but eventually relents. He uses his architectural expertise to design a bigger, better raft, and with the help of a couple of guys who’d been doing renovations on his house, they all build the thing together. They’re played by Orlando Jones, who goes by the nickname Dumbass (which isn’t terribly funny the first time), and Richard Robichaux, who speaks in a mangled mix of Cajun French and English (Cajlish?) that mostly consists of words like boudin and etouffee. Aside from that, you’d never know “The Book of Love” takes place in New Orleans. Purple wisely avoids the obvious tourist traps, but he rarely establishes a sense of place in one of the most culturally distinctive cities in the country. Ostensibly, the two men are meant to function as comic relief during these otherwise maudlin circumstances. Henry also tries to escape the pain through pot, either by smoking it or cooking it up in a stew. Marijuana is very edgy! 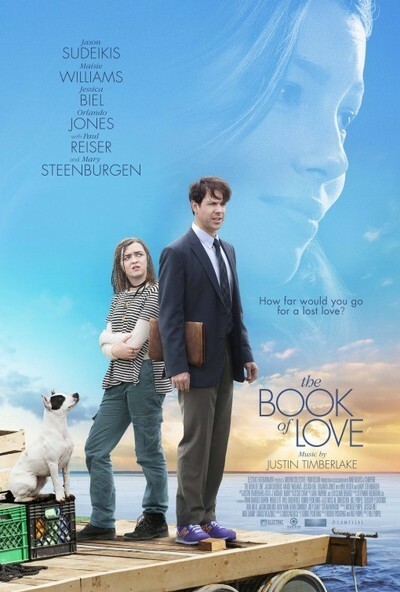 Mostly, though, “The Book of Love” seems more interested in exploring sappy, facile platitudes about love and redemption, with a treacly score from Justin Timberlake (Biel’s husband, who ordinarily can do no wrong) swelling to punctuate obvious moments of catharsis. Along the way, Millie becomes a wife figure (in a chaste way) to Henry, in that she functions as his caretaker and companion, as well as the daughter he wouldn’t have otherwise. She has an impossible knack for saying just the right, poignant thing at just the right time, every time—the kind of person who exists in movies, not in real life. In turn, he shares the things with her that he used to share with Penny, like Tuesday night kung fu movies and sugary breakfast cereals—although Penny makes plenty of appearances in sun-dappled flashbacks, so it’s as if she’s still around. It isn’t creepy, but it isn’t terribly plausible, either. It’s just another movie in which a 30ish white dude finds purpose and learns how to live life again through the love and support of a younger woman who’s more of a concept than a real person.